March 9th, 2009 by Alisha K.
Valve’s twisted puzzle game, Portal, may sport the stark, empty environments of the title’s test center setting, but even with a minimalist backdrop, Portal’s rich with atmosphere. One of the most memorable things about the game? The wonderful Aperture Science safety signs. 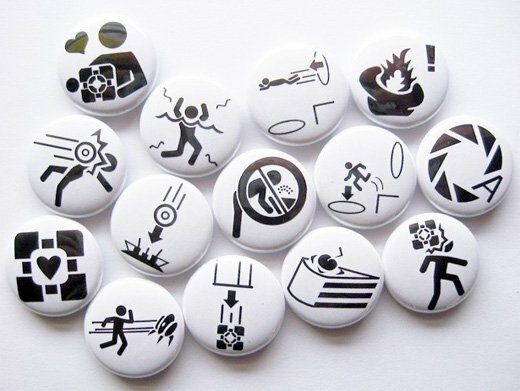 Just in case you need a constant reminder not to walk in front of any turret buddies you happen to encounter, a friendly soul at Etsy has immortalized the signs in the form of buttons. Your life will instantly become 20% safer if you wear these buttons. Please be advised that the buttons are $10 for the complete set. Now if only they included tiny, tinny speakers with the voice of GLaDOS.